Abscorbic acid commonly known as Vitamin C is a water-soluble vitamin, which is necessary in the body to form collagen in bones, cartilage, muscle, and blood vessels and aids in the absorption of iron. Dietary sources of vitamin C include fruits and vegetables, particularly citrus fruits such as oranges. Severe deficiency of vitamin C causes scurvy. Although rare, scurvy includes potentially severe consequences, and can cause sudden death. Patients with scurvy are treated with vitamin C and should be under medical supervision. Many uses for vitamin C have been proposed, but few have been found to be beneficial in scientific studies. In particular, research in asthma, cancer, and diabetes remains inconclusive, and no benefits have been found in the prevention of cataracts or heart disease. At Booth 1230, Lumex Instruments will demonstrate the mercury analyzer RA-915M with the pyrolizer Pyro-915+, capillary electrophoresis system Capel-205, atomic absorption (AA) spectrometer MGA-1000, PCR analyzer AriaDNA and fluorescence analyzer Fluorat-02. Vitamin C may reduce the harm done to lungs in infants born to mothers who smoke during their pregnancy, according to a randomized, controlled trial published online in the American Thoracic Society’s American Journal of Respiratory and Critical Care Medicine. Nearly 15 percent of all chewing gum varieties sold promise to provide health-enhancing supplements to users, so Penn State researchers studied whether two vitamin-supplemented products were effective at delivering vitamins to the body. Their results validate the concept of gum as an effective delivery system for at least some vitamins. Women who are unable to quit smoking during their pregnancy may reduce the harm smoking does to their baby's lungs by taking vitamin C, according to a new randomized, controlled trial presented at the ATS 2018 International Conference. Vitamin C is best known as a nutrient. In high enough doses, however, vitamin C also shows potential against many cancers, according to recent studies. To successfully develop vitamin C (chemically named ascorbic acid) as a medication, it is crucial to probe its concentration in the body, thus ensuring safe and effective doses. 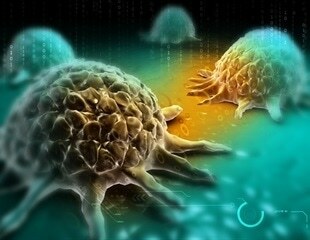 CANCER stem cells, which fuel the growth of fatal tumors, can be knocked out by a one-two combination of antibiotics and Vitamin C in a new experimental strategy, published by researchers at the University of Salford, UK. Researchers measure the impact on cancer stem cell metabolism of 3 natural substances, 3 experimental pharmaceuticals and 1 clinical drug. University of Alabama researchers soon will launch a study that looks at watermelon juice as a way to reduce heart disease. Researchers from IBBL and the Luxembourg Centre for Systems Biomedicine of the University of Luxembourg have investigated the impact of variations in temperature and delays during blood sample processing on downstream metabolomics applications. Researchers have identified a new signaling pathway that helps cancer cells cope with the lack of oxygen found inside tumors. These are the results of a study published in Nature Cell Biology on June 20, and led by researchers at NYU Langone Medical Center and its Laura and Isaac Perlmutter Cancer Center, Princess Margaret Cancer Center, the University of Toronto, Harvard Medical School and Oxford University. Chronic exposure to alcohol interferes with the pancreas' ability to absorb vitamin C, potentially predisposing the body to pancreatitis and other pancreatic diseases, a new study in the American Journal of Physiology—Cell Physiology reports. An engineer and an ophthalmologist are developing a portable sensor that can quickly and inexpensively determine whether an eye injury is mild or severe. The device, called OcuCheck, measures levels of vitamin C in the fluids that coat or leak from the eye. Diabetic patients have to monitor blood glucose regularly and frequently, but conventional method of taking blood sample for measuring glucose level is painful. It is therefore important to develop high performance biological sensors for monitoring the glucose level at a reasonable cost. RepliCel Life Sciences Inc., a clinical stage regenerative medicine company, is pleased to announce that the final design specifications of its next-generation dermal injector (RCI-02) have been locked. Prototypes for industrial and regulatory testing will now be built to prepare for an application for CE mark clearance to market the injector in Europe in 2016. Sweetpotato is known to be a good source of ascorbic acid (vitamin C) and certain B vitamins that are considered essential to human health. Besides the commonly consumed root of the plant, certain tissues in sweetpotato are also edible and high in nutritional value. Although studies have confirmed that water-soluble vitamins exist in sweetpotato roots and leaves, there has been limited information about how these vitamins are actually distributed in the plants. Scientists at NYU Langone Medical Center have found a way to boost dramatically the efficiency of the process for turning adult cells into so-called pluripotent stem cells by combining three well-known compounds, including vitamin C.
The Epstein-Barr virus (EBV) is a member of the herpes family that targets lymphocytes and epithelial cells. While the infection is usually benign, it can in some cases lead to acute infectious mononucleosis and can impair the immune system. EBV is also linked to several malignancies. There is currently no cure for removing EBV infections and very little success treating acute EBV infection and mononucleosis with drugs.